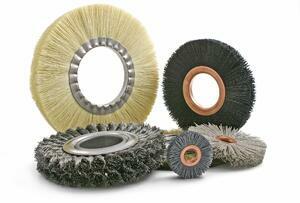 Wheel brushes are wheel-shaped brushing tools for surface preparation and surface finishing. Their uses include parts cleaning, polishing, edge blending, and deburring. A type of power brush, wheel brushes are designed for use under power, such as with an angle, bench, or pedestal grinder. Different types of wheel brushes are available, and buyers need to consider product specifications as well as operating parameters. To select the right wheel brush for your application, you’ll need to specify more than just a brush type and size. Wheel brushes are available with different filament materials, and some of these materials come in different filament sizes. To accommodate rotating shafts, many wheel brushes have an arbor hole. If the shaft size doesn’t match the size of the arbor hole, then an adaptor is necessary. Mandrel mounted wheel brushes have integral shafts or shanks that eliminate the need for a separate adaptor. Like other wheel brushes, they can have either a flared or a standard-style face. Typically, flared wheel brushes are used for finishing shoulders, corners, and other hard-to-reach areas. Standard wheel brushes are available in sizes from 3 to 15 inches, but 6 and 8-inch diameter brushes are used most commonly. Wheel brushes have filaments made of brass, carbon steel, stainless steel, nylon, abrasive nylon, or Tampico. Wire wheel brushes have either knotted wire or crimped wire filaments. Knotted wire wheels have tufts that reduce wire fatigue by absorbing vibrations. Crimped wire wheels are designated for standard, super-duty, or heavy-applications. The base material of the workpiece and your surface finishing requirements determine which filament material to select. For example, stainless steel brushes are often used with aluminum, stainless steel, and other non-ferrous metals to prevent “after-rust” from appearing on the workpiece surface. Wheel brushes with Tampico filaments are a good choice for polishing chrome parts. Nylon wheels are well-suited for light cleaning, polishing, deburring, and surface finishing. These wheel brushes are resistant to most solvents and have excellent fatigue life. Abrasive nylon wheel brushes are a great alternative to steel filament brushes for surface finishing and deburring various base metals. Accordingly, nylon abrasive wheels come in different abrasive types and grit sizes. For high-performance brushing, choose NamPower wheel brushes. In addition to filament material and filament size, wheel brush buyers need to consider the brush tool’s diameter and face width. Typically, a wheel brush with a narrow face has longer trim. This makes it a good choice for irregular surfaces with deep crevices, and for softer polishing action. Buyers may also want to consider that larger-diameter brushes tend to push away from the workpiece surface. With all wheel brushes, it’s important to follow standard guidelines and best practices for safety and performance. Operate the wheel brush at the fastest possible safe speed, but always within safe speed limits. Apply the lightest possible pressure to the workpiece surface, and remember to reverse the brush from time-to-time. This will extend brush life and improve cutting action. 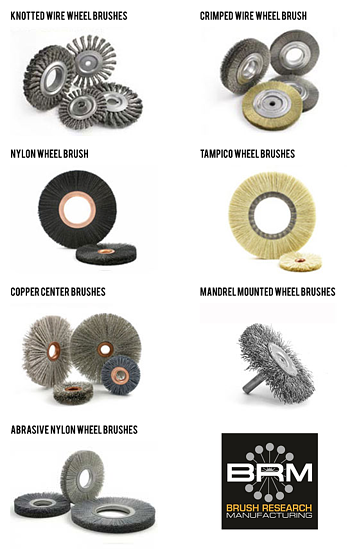 For more information about wheel brush selection and use, download The Use of Industrial Brushes, a free technical book from Brush Research Manufacturing (BRM).